One of the unparalleled most popular holiday destinations of all is the island of Tenerife. Situated within the Canary Islands archipelago, Tenerife attracts over 10 million visitors every year. Its wealth of beaches, famous nightlife, and all-inclusive resorts offer a sunny, warm holiday, with plenty of fun to be had for all. Whilst Tenerife may be most famous for the rowdy resorts on the south of the island, where the main body of young tourists head for their annual blowout, there is another side to Tenerife. It’s a great destination for families, couples and older travellers. Its range of cultural and natural features make the island ideally suited for those seeking to learn a little more, and to discover the natural beauty of Tenerife. The Parque Nacional de Teide is, quite simply, an absolute highlight of any trip to Tenerife. The volcanic El Teide is the highest in all of Spain, and is a spectacular sight to see. Through the UNESCO World Heritage site that is the National Park, winding hiking routes lead visitors through the rocky terrain and up towards the summit of Teide itself. If you don’t fancy that five hour climb to the summit, there’s always a cable car. About 4 million visitors head to the Parque Nacional de Teide every year, and very few leave disappointed. The best time to visit Mount Teide is in early spring, when the lower slopes of the volcano are alive with flowers in bloom, and where you may find the summit still donning its winter snowy cap. In fact, in the dead of winter, the park and surrounding areas can find themselves under heavy snow – hard to believe on such a perennially sunny island. Culturally speaking, Tenerife is brimming. Museums, modern art galleries and year-round concerts and shows, make for a more civilised holiday. As do the old colonial towns, endless hidden gems of bars and restaurants off the main tourist trails, and the markets and shopping opportunities in the capital of Santa Cruz, and – indeed – all over the island. Whilst not much need be said about the nightlife in the south of Tenerife (its reputation speaks for itself), for those who enjoy a bit of bar life, Santa Cruz in the north of the island is a much more grown-up and civilised night spot. It is home to more sophisticated cocktail bars, and if you head down to Puerto de la Cruz, you can enjoy some truly authentic south American style dancing till dawn. 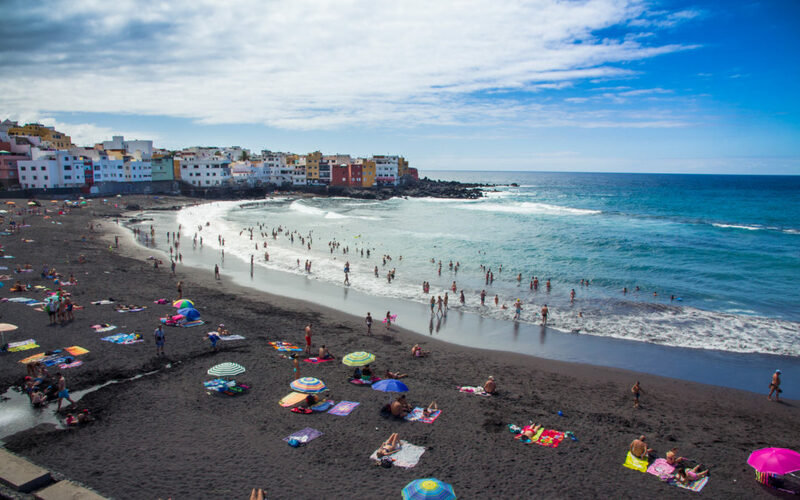 Tenerife is also well known for its many fiestas and romerias, which take place throughout the year – particularly during the summer months. Perhaps the most famous, and the most fun, of these is the Carnivale de Santa Cruz, which takes place every February. It’s Tenerife’s answer to Rio Carnivale, and though quite not on the scale of Brazil’s world-famous event, it’s the biggest party in the Tenerife calendar, attracting locals and tourists alike to revel in dancing, fine food and drink, costumes and endless fun, late into the night. For kids, too, Tenerife never fails to disappoint. One of the most popular destinations for families is Siam Park, situated in the Costa Adeje region of the lower west coast. With an impressive array of waterslides, pools and other features, there is scarcely a child who doesn’t go absolutely crazy for Siam Park. There’s also Aqualand, which also has its fair share of waterslides. However, it is a dolphin park, which many people find morally objectionable, and not without good reason. If the kids want some animal time whilst on holiday in Tenerife, there is the Park las Aguilas Jungle Park, where over 300 animals are free to roam in a more natural setting. It makes for a good day out, although still owned by the same company as Aqualand – and, y’know, captive sea lions for gawping tourists to swim with, and all that. We need not tell you about the range of accommodation options in Tenerife. It’s, of course, a great place to hold a timeshare, but even if that’s not your cuppa tea, the wealth of hotels will certainly give you plenty to choose from. There are loads of all-inclusive resorts on the island, which are great if you’re on a family break and would rather have as little to worry about as possible. Then there are adults-only resorts, for if you’re trying to get away from all that family fuss. Apartments, villas, B&Bs, and more, are available all over Tenerife, making it easy to book a holiday in the sun, whatever your budget.